There are a number of options for responding to telephone calls at your NowRenting phone number. Navigate to Settings > Message Settings. 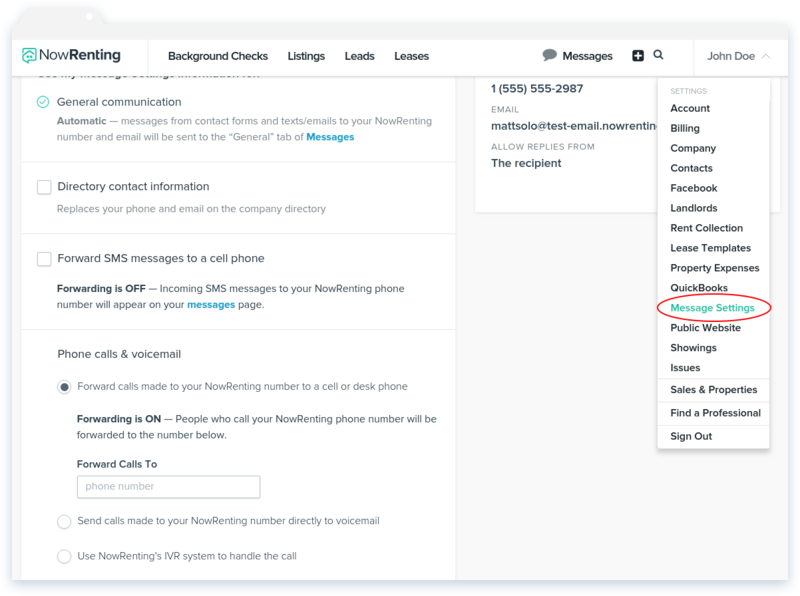 Text messages will usually be routed to your NowRenting Messages Dashboard, but if you’d like to forward them to a cell phone, you can do so by checking the Forward SMS messages to a cell phone box and entering the cell number in the input that will appear. Forward Calls: This option lets you forward calls made to your NowRenting number to a cell or desk phone. Specify the number in the input box provided. Voicemail: Send calls made to your NowRenting number directly to voicemail. IVR: Use NowRenting’s IVR system to handle the call. Read more about IVR here. To learn about how to change your NowRenting phone number, which is also available on this page, read the article here.